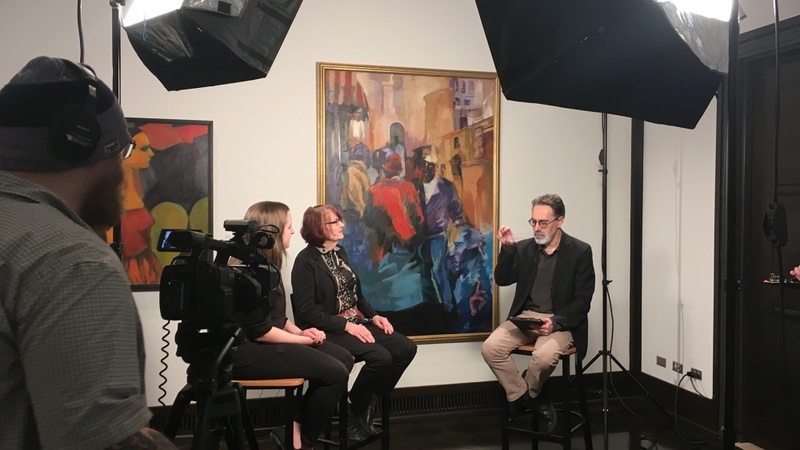 On a new UO Today, artist Margaret Coe and curator Danielle Knapp talk about “Mark Clarke and Margaret Coe: Our Lives in Paint,” a current exhibition at the Jordan Schnitzer Museum of Art. It will be on display until April 1. The exhibition features paintings of Coe and Clarke, two artists educated at the UO. Clarke died Jan. 11, 2016. “We just really wanted to honor that fact that there are phenomenal artists who have been making their careers here, looking out the windows that we all look out here in Eugene, looking at that same sky, that same landscape, that same people and responding to that in their incredible, artistic, creative interpretations,” Knapp said. Knapp is the museum’s McCosh Associate Curator. David McCosh was a UO faculty member from 1934 to 1970, teaching courses in lithography, drawing, oil painting and watercolors. Coe and Clarke were two of his students. After meeting as students, Coe and Clarke formed a close friendship that lasted the rest of Clarke’s life. For the most part, however, each did not pay much attention to the artistic work of the other. “As we evolved over the years, it was a value to us both to be very separately painting,” Coe said. Coe and Clarke developed distinct styles. Clarke was a fifth-generation Oregonian who painted acrylic landscapes capturing the Willamette Valley and the Oregon Coast. He also dipped into portraiture. Meanwhile, Coe first committed herself to oil painting while pursuing her master’s degree in the late 1970s. Coe also talked about her artistic influences and her time spent traveling and painting around Europe. For the full interview, go to the UO Today channel.